Nirvana faithful finally got the chance to revisit the band's 1992 Reading Festival set with the release of Live at Reading in 2009. But for those whose fandom knows no bounds, Kurt Cobain's attire from the evening is set to head to auction. 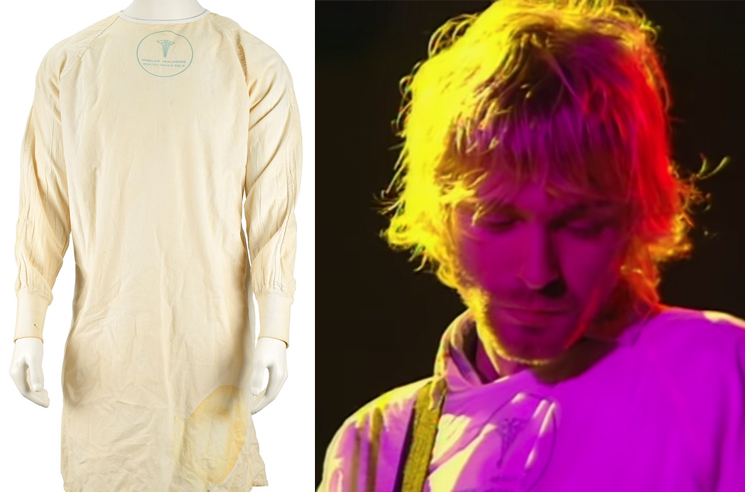 Cobain's hospital gown that he sported onstage at Reading that year is set to hit the block through Boston-based auction house RR Auctions on March 14. The garment is expected to fetch upwards of $50,000 USD. The gown is said to be "in fine condition, with scattered stains and expected wear; lower tie string torn from left side, but remains tied to opposite side string; and just below logo are two small rusty holes from where Cobain had placed a small button." A few days after his death, there was a vigil for Cobain at the Seattle Center…About a dozen of us stayed long after the festivities ended. We sat in the Flag Pavilion listening to music…just hanging out among the candles and flowers fans had placed there earlier. Late that evening, Courtney Love showed up accompanied by Kat Bjelland of Babes in Toyland with a bag of Kurt's clothes. She was visibly grief-stricken and proceeded to pass the clothes out while asking trivia about Kurt's life…She handed me his hospital gown from the legendary Reading Festival performance from 1992. She then cried on my shoulder for a while. I tried to say something reassuring about his love for her and she pushed me away, insisting that he only loved Frances…The entire incident was sad. And weird. And it blew my teenage mind. 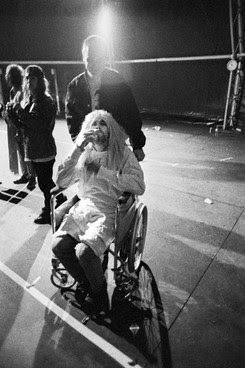 Sporting the gown at Reading, Cobain was taken out onto the festival stage in a wheelchair by music journalist Everett True. RR Auctions calls the garment an "iconic and museum-quality piece" that "represents the Nirvana frontman at his finest and most sardonic, jabbing pointedly at critics and detractors alike while retaining the intensely original showmanship that made him a living legend." Back in 2017, Cobain's Blockbuster Video card hit the auction block, with the bidding opening at $100 USD.